Saute your veggies (i.e. chard, spinach, kale, zucchini...), until almost cooked. 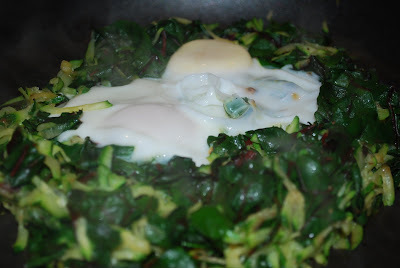 Create a "nest", for your eggs, with the veggies. Crack the eggs into your "nest". Cover your pan with a lid and cook eggs to desired doneness. This WOD was inspired by one of my favorite CrossFit bloggers...she makes up workouts and we willingly submit! :) It would be fun to do this one as a sort of couple's challenge...scoring the results by calculating movements/minutes to complete. Try that at your next dinner party! We modified the workout slightly by rowing, instead of running, and by switching up the movements a bit, but used the layout she provided. This was a great Sunday night WOD! And, in the end it really exemplified how much Scott cares for me, as he rowed his hardest during every round (making my rounds shorter)...so romantic!